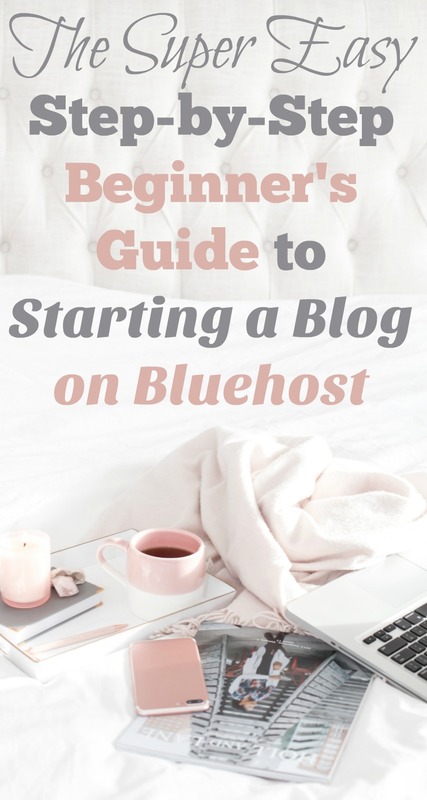 This tutorial will show you step-by-step how to start a blog on bluehost. Before you begin writing content, set up an email list, decide on the best blog income streams, create an ecourse, or simply be the fabulous blogger I know you can be – you need to first start a blog. What do I mean by starting a blog? Well, for the purpose of this tutorial I’m referring to choosing a blogging platform, domain name, setting up hosting, and picking a theme. Basically, taking the first step to becoming a professional blogger. Before I go through the steps to get your blog up and running I just want to quickly talk about blogging platforms – you’ll need to choose a blogging platform. A blogging platform is what you’ll use to write your blog. Currently, there are many blogging platforms to choose from but I don’t want to confuse you with all the different options so I’m going to recommend the blogging platform I use for both of my blogs – WordPress. WordPress is by far the most popular WordPress blogging platform used by professional bloggers. It’s easy to use and filled with features to help you create a beautiful and profitable blog. Bluehost automatically downloads WordPress after your register for a hosting plan. This makes it incredibly easy to get started. Keep reading to see what I’m talking about. Okay, let me break this down for you. I’m going to take you through getting your blog starting using Bluehost. The first thing you need to do when starting a blog is register a domain name. A domain name is your address on the internet. It’s what people type into their web browser to find you. For example, www.organizeyourselfskinny.com is the domain name for my blog Organize Yourself Skinny. www.bigbossmoves.com is the domain name for this blog. Picking out your domain can be fun but it can also be stressful. You want the perfect name, and rightfully so, this is the name of your brand new blog! However, don’t get caught up in the name. It’s easy to dwell for days, months, and even years on “the perfect” name instead of spending time on the things that really matter with blogging – writing content. So, my advice is to take time to think about the domain name but don’t let it paralyze you from getting started. However, don’t jump into a name you’re not 100% comfortable with because once you start blogging with that domain name it’ll be difficult to change it. Also, don’t wait too long to purchase your domain name because there are 1000s of new blogs starting every single day and it’s likely if you don’t purchase your domain name someone else will. You can click here to search for domain names, purchase your domain, and then create a blog on BlueHost. A good blog name is important but it’s not THE most important aspect of your blog so don’t get caught up in “the perfect” name. The thing that makes a blog successful is the content you’ll write and the relationships you’ll build with readers. Here are some more tips for choosing a domain name. Keep it short and sweet. You want to make it easy for someone to remember and type into their web browser. Try to get a .com. This is what people are most familiar with and will remember. Don’t use dashes or other symbols. Again, you want to make it easy for readers to remember. Think about it. Is it easier to remember myblog.com or my-blog.com. If you can’t think of the “perfect name” consider using your name. I’ve see many bloggers do this for a variety of niches and it works great. This is helpful too if you’re unsure on the topics you want to write about. Again, a successful blog built on the content you write, your voice, and the relationship you build with readers. Remember readers come back for you not because you have a great blog name. This is just a personal preference. I recommend keeping the word “mom” or “mommy” out of your blog name. 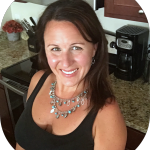 When I first started blogging my blog name was Skinny Mom’s Kitchen. After a couple years I had to change the name for reasons beyond my control. Anyway, when it changed over to Organize Yourself Skinny is when my blog traffic started to increase. Organize Yourself Skinny was an easier name to market and included everyone – not just mom’s. Not to mention it described better what my blog was about. Now this is just a suggestion and based on my experience. You can call your blog whatever you want. Before going onto the next step, take some time and search for and register your domain name. Now that you have your domain name it’s time to set up hosting. Before I get into how to set up your blog on Bluehost I just want to quickly explain what hosting is. Like I said your domain name is your address on the web. Hosting is your home or space on the internet. So think of your hosting fees as your rent or mortgage for your blog. This is the part where people get very confused. I get it, setting up hosting is technical and can be nerve-racking, especially when you have to spend money. Not only does Bluehost make it very affordable to get your blog up and running but it makes the set up process easy too. This is why many new bloggers start with Bluehost. If you sign-up for a 12-month hosting plan through Bluehost you’ll get your domain name for free – this makes starting a blog even more affordable. 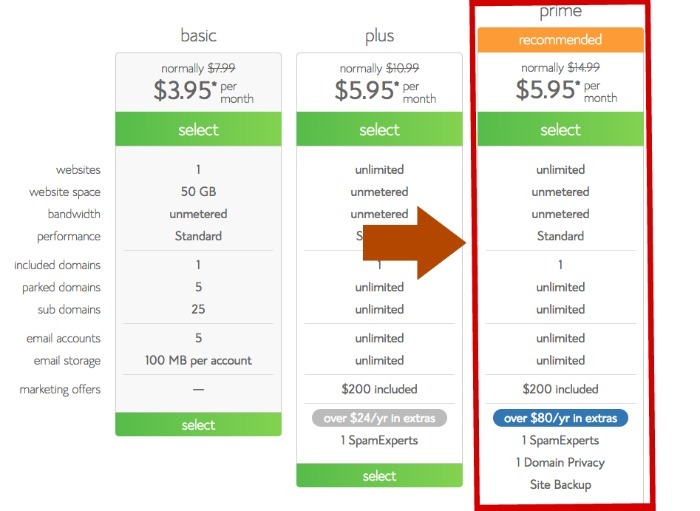 Actually, the longer the hosting plan you choose the cheaper the monthly price. 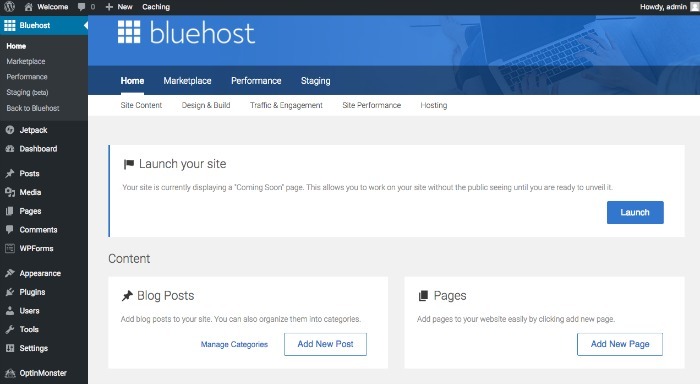 Let’s go over the hosting plans and walk step by step through how to start a blog on Bluehost. The first thing you’ll do is click on the green “get started now” button. There are different advanced plans to choose from but as a new blogger this will lead you to the basic plans. These are the 3 hosting plans recommended for new bloggers. Personally, I would choose the Prime plan. It’s still inexpensive but includes domain privacy and site back up which are two services you’ll need and appreciate. Domain privacy hides the personal information of the person who purchased the domain – I recommend you get this. Click select and you’ll be led to the next section. This is where you’ll register your new domain. Type in your blog address into the “new domain” section. From there it will let you know if it’s available. If it is, you’ll move along to the next section. Woohoo you’re getting closer to creating a blog! 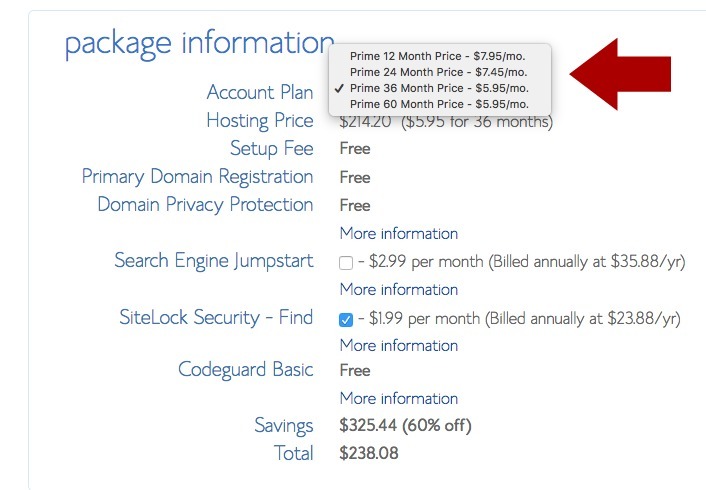 Remember your domain name is free with a 12-month or longer Bluehost hosting package. If your domain is available you’ll be prompted to create an account. Get your credit card out because your first blog purchase is about to be made. 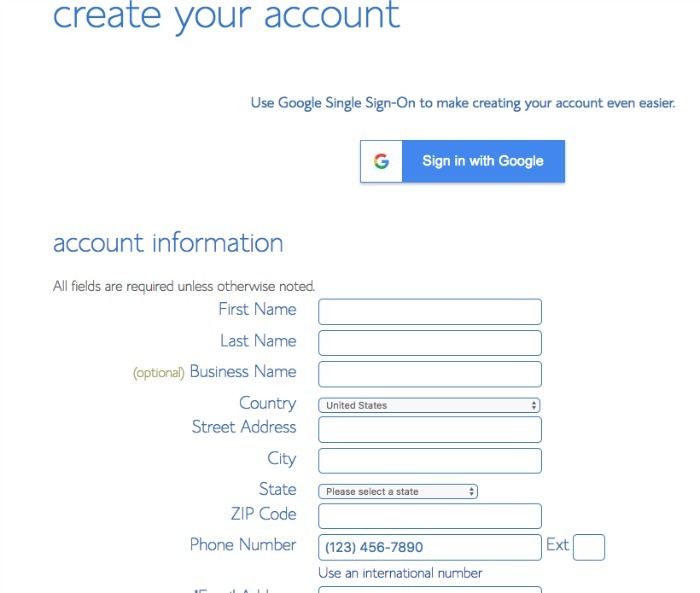 In the first section, you simply need to fill in your personal information. 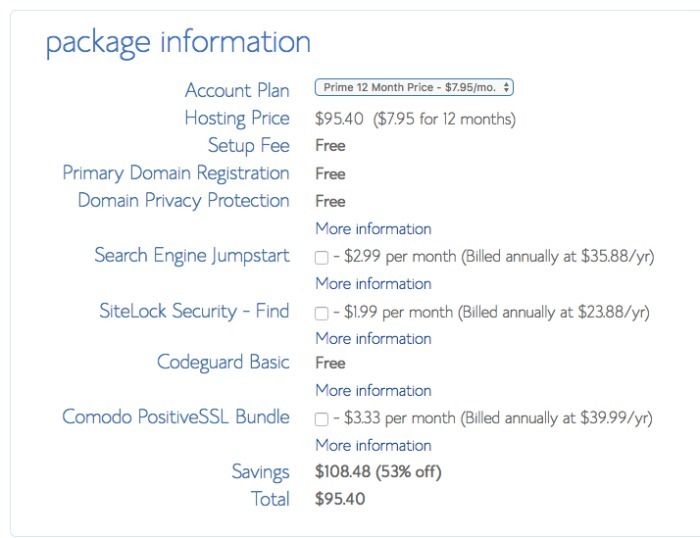 In the second section is where you’ll choose the hosting package. As you can see, the longer the package the cheaper your monthly rate is. Keep in mind, to receive these low hosting cost Bluehost requires you to pay a year in advance. If you definitely want to pay monthly then contact Bluehost at 844-303-1810 and they can work out a monthly contract for you. However, to get the best price you’ll need to pay for at least a year ahead of time. If you don’t want to drop a $200+ on hosting off the bat then I recommend signing up for a 12-month plan. That still is $7.95 a month (with a free domain) and that’s a great price. The total price to start a blog is less than $100! After you choose your plan, and pay for it, you’re officially set up on Bluehost! Woohoo! Only a couple more steps and your blog will be ready! Just hit no thanks for whatever special offer Bluehost is promoting. That will lead you to the next page where you’ll need to create a password. 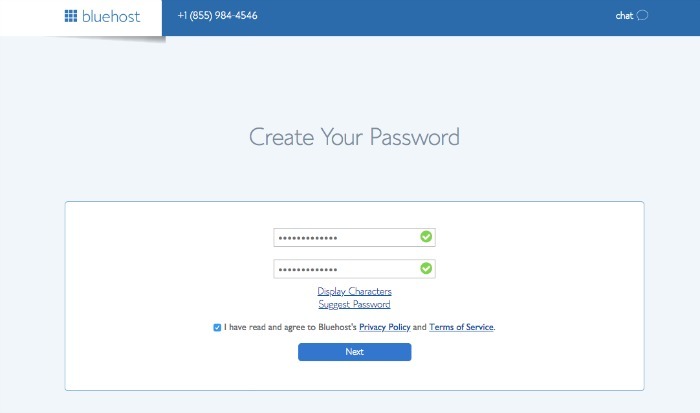 Keep this password handy because you’ll need it to log into your Bluehost account and blog. This is where you’ll create your password. Yay! Your password is created and now it’s time to log in. Honestly, this should take less than 10 minutes to complete. 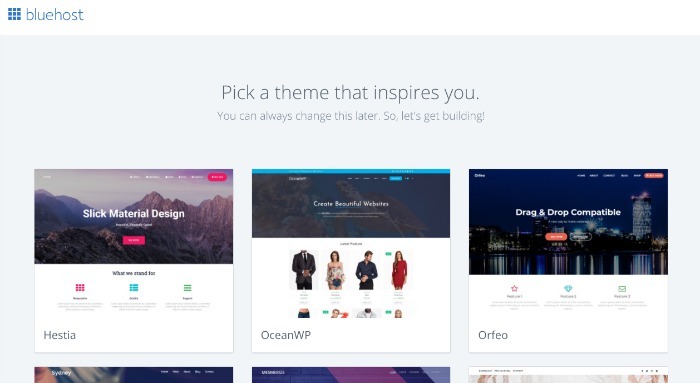 After you log in Bluehost will ask you to pick a theme for your blog. At this point, just click skip this step. You can come back to themes. Let’s first get your WordPress blog set up! 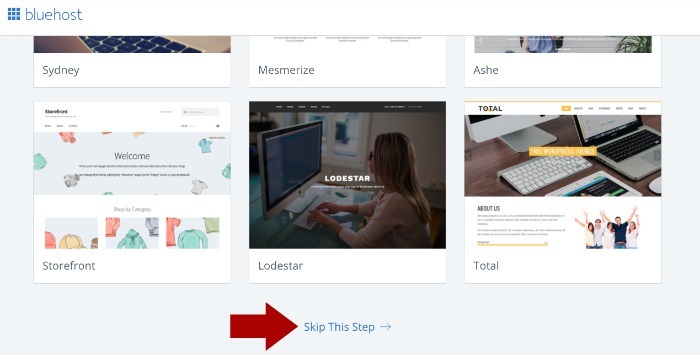 After you click “skip this step” Bluehost will start to set up WordPress for you. Like I said earlier WordPress is the blogging platform or software you’ll use to write your blog. Think of it like pages or word for blogging but WAAAAY more advance. There is other blog software available but WordPress is the most popular among all professional bloggers and is the only one I’ve ever used. Setup takes about a minute. You are officially a blogger! Take a deep breath and relish in this moment. Yes there’s a lot of work ahead but you just took that first step and THAT’S the hardest part. On the screen click “start building” – you don’t need to go into your Bluehost account right now. This is what the inside of your blog looks like – it’s where the magic will happen. Bluehost keeps your blog in “maintenance mode” until you’re ready to officially launch. This gives you time to add content, create pages, and make it look pretty before showing it to the world. When your blog is ready for the world to see click the launch button. One more thing. Bluehost will keep your site on a temporary domain for about 24hours. Don’t be alarmed by this they are simply working hard behind the scenes making sure everything is working properly. You’re blog is set up, now what? Write your About Me Page, Disclosure Policy Page, Resource Page, and any other page. You can add a page by clicking on the “pages” tab on the left. You can add a new post by clicking on the “posts” tab to the left. If you’d like to add content to your sidebar or footers then go into the “appearance” tab and then click on “widgets”. You can change the theme of your blog by going into the “appearance” tab and then clicking on “themes”. WordPress offers free themes but if you’re looking to purchase a theme then I highly recommend Studio Press Themes. The theme is how your blog looks when someone goes to your site. If you’d like to hire a designer to create and install a new theme then I recommend checking out Restored 316 Designs. She has gorgeous themes and offers installation services for affordable prices. Of course, there are many things you can do after you start a blog but these are just a few suggestions to get your blog ready for the world to see.